Background: Alzheimer’s disease (AD) is characterized by the accumulation and deposition of β-amyloid peptides leading to a progressive neuronal damage and cell loss. Besides several hypotheses for explaining the neurodegenerative mechanisms, oxidative stress has been considered to be one of them. Till date, there is no cure for AD, but the pathogenesis of the disease could be delayed by the use of natural antioxidants. In this context, we decided to study the effect of kaempferol against the transgenic Drosophila expressing human amyloid beta-42. Method: The AD flies were allowed to feed on the diet having 10, 20, 30 and 40µM of kaempferol for 30 days. After 30 days of exposure, the amyloid beta flies were studied for their climbing ability and Aversive Phototaxis Suppression assay. Amyloid beta flies head homogenate was prepared for estimating the oxidative stress markers, Caspase and acetylcholinesterase activity. 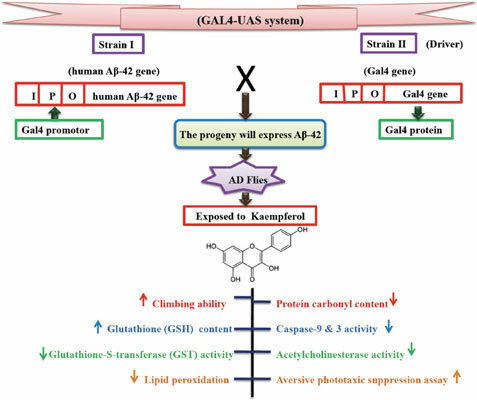 Results: The results of the present study reveal that the exposure of AD flies to kaempferol delayed the loss of climbing ability, memory, reduced the oxidative stress and acetylcholinesterase activity. Conclusion: Kaempferol could be used as a possible therapeutic agent against the progression of the Alzheimer’s disease. Kaempferol, Alzheimer`s disease, Drosophila, transgenic, peptides, neuronal damage.